To celebrate the Lunar New Year, I’m so excited to review a new middle grade novel set in China. A.L. 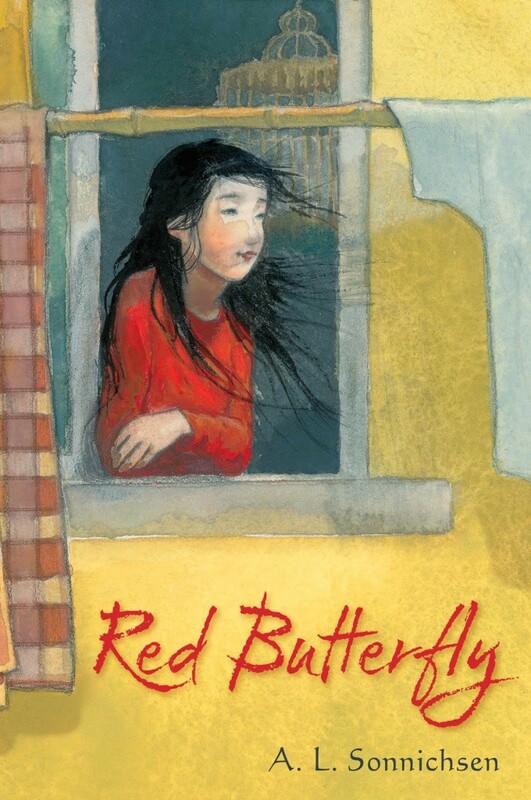 Sonnichsen’s Red Butterfly (Simon & Schuster Books for Young Readers) just came out at the beginning of the month and it’s absolutely wonderful! The story takes place in the northern city of Tianjin, not too far from Beijing. Kara is an eleven year-old Chinese girl who was adopted by an older American couple. But when Kara’s father leaves to go back to the US, Kara and her mother struggle to find enough food to eat. To make matters worse, they cannot appear in public together because Kara’s mother is in China on an expired visa. Kara’s parents have an older daughter who visits Tianjin and develops a sudden medical emergency. One day Kara’s mother leaves the hospital on a quick trip back to her apartment to collect some supplies. But she never returns. The worst comes true and Kara’s mother ends up getting deported. Since Kara is only eleven, she’s sent to an orphanage from which she hopes her parents back in the US will be able to formally adopt her and take her to their home in Montana. The story gets more complicated and thrilling at this point when another American family comes into the picture. I read the book in two days, as did my almost-eight year-old daughter. The illustrations are stunning and the style is smart and fun as it’s written in prose. I really love Red Butterfly and will be giving other copies away as gifts. It’s perfect for middle grade readers and adults alike.